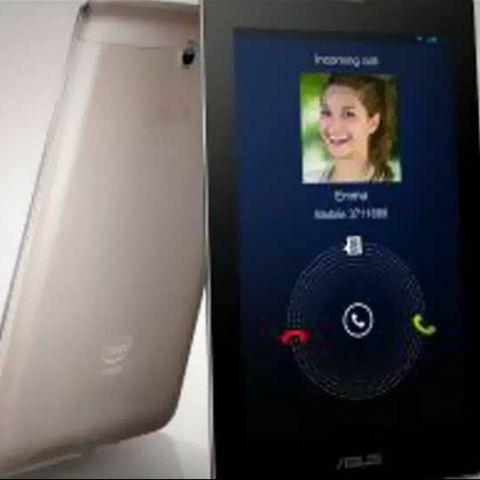 Asus will unveil its FonePad in India tomorrow. The device is a 7-inch tablet with the ability to make calls running Android. First unveiled at MWC 2013, the Asus FonePad will be introduced to the Indian market tomorrow at a launch event in New Delhi, where pricing and availability will also be revealed. The FonePad is a 7-inch tablet running Android with the ability to make calls. Apart from making calls, the tablet also boasts of 3G HSPA connectivity. The 7-inch display has a 1280x800 pixel resolution and it runs on Android 4.1 Jelly Bean. The unique thing about the FonePad is that an Intel Atom Z2420 single-core 1.2GHz (with Hyper-Threading) processor powers it. It also sports 1GB RAM and PowerVR SGX540 graphics. The device also has expandable storage up to 32GB via a microSD card and built-in storage of 16GB. Made out of metal, the FonePad weighs 340 grams and is relatively slim at 10.4mm. It doesn’t house a rear-facing camera but has a 1.2MP front facing camera for video calls. A 4270mAh battery powers the tablet. There is no official information available about the pricing, but we think that it will be priced somewhere around the Rs. 15,000 price point. At CES 2013 Intel showed off the Atom Z2420 processor with Intel Hyper-Threading Technology clocked at 1.2GHz. It supports 1080p hardware-accelerated encode/decode, and support for up to two cameras delivering advanced imaging capabilities, including burst mode that allows people to capture seven pictures in less than a second in 5-megapixel quality. The platform also includes the Intel XMM 6265 HSPA modem that offers Dual SIM / Dual Standby capability for cost-conscious consumers. We have seen the Xolo X500 running on Intel Atom Z2420 Lexington. You can take a look at the benchmark scores of the Xolo X500.